Some parts of this job, no matter how many times you do them, never get old. Whether that is seeing something you’ve produced situated in an exhibit in one of the city’s biggest museums or waking up and realising that today you’re going to get to do something that very few people have ever been able to do. It’s a special feeling (and, from a personal point of view, it makes explaining your job at parties much more exciting). One of those special shoots happened a few months ago where Mark and myself were asked to go to Buckingham Palace to film an incredibly special object. Or, to be more precise, 4 very special objects. I might add that on the list of things that never get old, being invited into one of the many spectacular rooms in Buckingham Palace ranks quite highly. We were fortunate enough in 2015 to work with a number of different departments of the Royal Collection. As part of their work they are continually restoring and preserving the priceless pieces of work in their possession. One of these objects was a small diamond encrusted ivory elephant automaton which, when wound up with a key, would walk across the table. By itself the object is amazing enough; a highly detailed and priceless piece of craftsmanship. The kind of thing which would usually sit behind a glass case in a museum but, for today, was sat on a red cloth in front of us, walking around on cue. 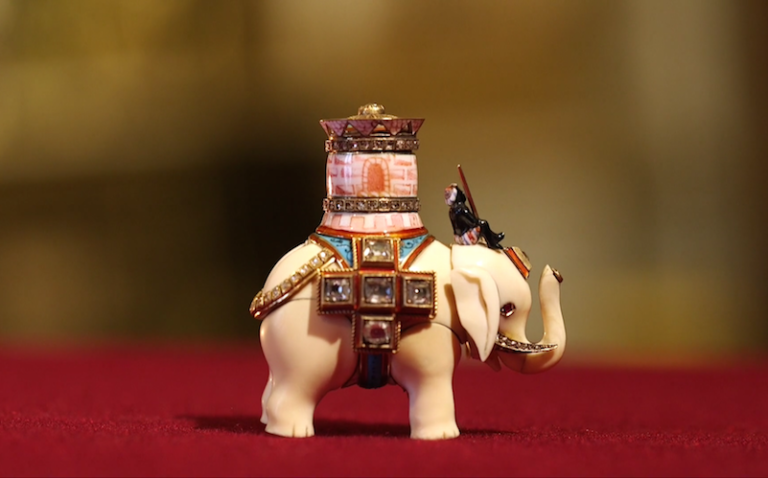 A Fabergé Surprise from Royal Collection Trust on Vimeo. The shoot felt very special to be a part of. The interview you can see in the video was filmed in “The White Room,” which is the kind of place you think of when someone talks about the inside of a palace. Decorated in white and gold from top to bottom, with chandeliers hanging what looks like 7ft from the ceiling, it really was something to behold. Finding a wide shot which looks breathtaking in such a room really was a very fun way to start the day. Using a mixture of our Canon EOS 5D MKII on a One Man Crew automated glide track and a Canon EOS C100, Mark and I worked closely with the conservators to capture many of the elephant’s intricate details. We were also incredibly privileged to be able to film 3 different Faberge Eggs on the day. Each of these are beautiful enough when looked at from a distance by the human eye but when looked at in HD through a 100mm Macro lens you start to be able to frame the kind of shots which are an absolute dream for a filmmaker. Like I said, there are some days that you wake up and get to take cameras into some very special places and do some really rather wonderful things. A discussion on the best way to light a Faberge egg to really get the diamonds sparkling is not something you think you’re ever going to have to worry about but if that’s the job, that’s the job. And it never gets old.